Amsterdam has almost 7000 monumental buildings and the biggest historical district of all European cities. It is best known for its three rings of canals, lined by thousands of exquisitely designed tradesmen's residences and warehouses, which date back to the 17th century. This period is known as the Golden Age of the Dutch. 90 islands were created when the canal network was dug, which are connected to each other through a vast number of bridges. This extensive tour will allow you to experience some of the best aspects of Amsterdam. Amsterdam Helicopters will take you over the historical part and the new town of this mesmerizing city, along many fascinating attractions, among which the Royal Palace, the National Monument, the Skinny Bridge, the Albert Cuyp Market and the charming houses lining the canals. You will also pass by the windmill on the riverbank of the Amstel. You can also take a boat tour along a characteristic Dutch canal. You are advised to choose the respective tour option at the time of reservation. The cruise along Amsterdam's canals will take one hour. You will pass through the old port as well. Remember to observe the Golden Age tradesmen's residences with their opulent and ornate facades, chapels with belfries and 16th and 17th century warehouses by the canals. Amsterdam Central Station is probably the busiest district in the city. Literally situated a few minutes from Schipol Airport, it is a meeting point for ones and departure point for others. Trams, trains, buses and subways make for a true hive of activity at Stationsplein 1, located on the South bank of the IJ. Buy your tickets for the intercity, stoptrain or TGV in and around Holland and other major European cities at one of the NS (National Spoorwegen) counters or machines. From Central Station you can also catch a ferry connecting the city to Amsterdam Noord, across the t’IJ. Ferries are free and you can board one just behind the station. Furthermore, all the top attractions and main districts are within easy reach whether by foot or tram, the cheapest ways of getting around Amsterdam. For visitors to Amsterdam, it is worth knowing that trams run until midnight, the last one leaving at 12:15. After the last tram, there is an hourly service of night buses. This square is a perfect gathering place, located amidst pubs and small restaurants, where you could have a nice lunch for little money and then have a walk along the canals and Amsterdam’s oldest houses. Having been a lively fish and cloth market in the past, the square upon which the castle like De Waag building stands, was the holding place for Jews arrested during WWII. In 1970s Chinese immigrants created a small Chinatown and a decade later locals protested against construction of a subway station there. Quiet canals and narrow streets, dating back to the 17th century – the district of Jordaan. That’s how Dutchmen manage to escape from the packed with tourists centre and avoid the hordes of sightseers, relaxing on a front stoop and chatting with their neighbour or in warmer weather, enjoying their dinner al fresco. The serene streets and unique architecture make the Jordaan ideal for strolling, especially on weekday mornings, when it's virtually deserted. Only recently has the region become a preferred perch of Amsterdam's yuppie population, making for an unusual mix of upscale eateries, down-home craft studios, and big cafes that fill up quickly in the evenings. Singel, Herengracht, Keizersgracht and Prinsengracht – these are the four main canals in Amsterdam – a magical quartet that was built over the course of the 17th and 18th centuries. At that point Amsterdam was confronted by the problem of urban saturation. Nowadays 7 000 houses are listed as monuments of historical importance, many of which date back to the Golden Age of the 18th century. The current properties in the area are said to be patrician and their construction was ordered by the rich traders of the city. Waterloo Square is the heart of Waterloo district. In the XIXth century there was a Jewish market on the square. Unfortunately during the Second World War most Jews perished and the district changed a lot. At present one of the most famous flea markets is situated here. In addition to that Waterloo is in the very centre of Amsterdam and as a result most of attractions are just steps away from it. Oud West (Old West) Isn’t the best place to wander at night, but during the day it becomes quite lively. In case you would like to reveal the dazzling regional diversity, which is typical for the area, take a walk down Kinkerstraat, JanPieter Heijestraat or any of the other major streets. Greek cafes, Turkish delis and Ethiopian restaurants – all of them can be found here, living in perfect harmony. Closest to the centre, the Oud West is far from the adjacent Jordaan. The area has a gritty urban energy, which cannot be found in the centre of the city. Vondelpark extends over several hundred acres with bike paths, walking paths, an open-air concert venue, three large outdoor cafes and the Film Museum and is a very popular place on warm, sunny days with the Dutch and tourists alike. Scattered through the park are ponds with swans and ducks, flower gardens, a children's park, a display of farm animals for the kids and acres and acres of fields to play soccer or frisbee. During the 60's and 70's the park became famous as a hippie hangout. Nowadays you will still see lots of hippies around and the occasional "camper" on warm nights. Rijksmuseum is the largest museum in the Netherlands. Set in its historic building, it is the largest in the size of its collections, its building, the budget and the number of staff employed. The museum is internationally renowned for its exhibitions and publications and not only for high quality products, but also areas in which the museum extends the boundaries of scholarship and encourages new insights. Each year, more than a million people visit the Rijksmuseum. The museum employs around 400 people, including 45 curators who are specialised in all areas. It also devotes considerable resources to education and to the decor and layout of exhibitions. Leading designers are regularly commissioned to work on Rijksmuseum projects. Formerly a working class quarter built to ease the overpopulated Jordaan in the 19 th century and to house labourers, de Pijp as we Amsterdammers know it today is without doubt a melting pot of cultures and nationalities. Nowadays the area is the most cosmopolitan and vibrant district of Amsterdam. ike the neighbouring district Jordaan, de Pijp is brimming with fantastic cafés, restaurants, coffee shops and bars. Of course, a visit to Amsterdam wouldn’t be the same without a trip to the Albert Cuypmarket, flanked by over 100 shops. If you walk down Albert Cuypstraat and Ferdinand Bolstraat, the main streets in de Pijp , you'll find many exotic and authentic Syrian, Moroccan, Surinamese restaurants and typical Amsterdam pubs are located on almost every corner. Also in abundance are the Islamic butchers, Surinamese, Spanish, Indian and Turkish delicatessens and grocery stores. The Oosterpark is a popular venue for cultural activities involving various groups including Surinamese, Indonesians, Indians, Muslims and others. It is located on the east side of Amsterdam, in a culturally diverse section of town. But anyone can enjoy this beautiful park. I found the design intriguing as the paths lead to sudden viewpoints offering different perspectives on each section of the park. The Amstel station is currently under major renovation and the surrounding area will be completely redesigned in the coming years, turning the station into an even bigger transportation hub. New shops have opened including several sandwich shops, a Pizza Hut, a ticket outlet for major entertainment events, a small Albert Hein market for snacks and groceries, and more is planned. The buildings from left to right, Amsterdam High School, the Rembrandt Tower (tallest building in Amsterdam), the Phillips tower and the Mondriaan Tower provide much more office space in what is becoming a choice location for multi-national business. Every year, Amsterdam RAI hosts more than fifty major international congresses, seventy trade fairs and exhibitions, events and over one thousand conferences, meetings and smaller functions. Located to the south-west of the City, this modern 87.000 square metre complex is unquestionably one of Europe's foremost venues for major international events. There are 22 congress rooms with seating capacities for up to 1750, and 11 exhibition halls with seating for up to 12.900 participants, and countless multi-purpose lounges for exhibitions and poster sessions. All of the halls and conference rooms are air-conditioned and offer all necessary facilities. The centre has got its own railway station and is less than ten minutes’ travelling time by train from Schiphol Airport. Olympic Stadium in Amsterdam was the main venue of the Olympic Games that took place in 1928. The stadium was originally designed by an architect Jan Wils. Then the object was twice rebuilt in 1937 and 1998. At present it has 64 000 seats and lots of sports and cultural events are held here. It is located between the city centre and Schiphol International Airport. Thus it is easily accessible by the residents of Amsterdam as well as international visitors. Amstelveen is a small neighbourhood located in the very centre of Amsterdam just steps away from Central Railway Station. Thus there are lots of attractions nearby such as: Damrak, Red Light District as well as some historic monuments and museums. The location is convenient for all those who want to visit Amsterdam thoroughly as you may easily reach most of hotspots by tram or underground. Sloten is located on the outskirts of Amsterdam between Nieuwe Meer and Badhoevedorp. Schiphol International Airport is just 5 kilometres away, while city centre of Amsterdam may be reached within 30-40 minutes by the public means of transportation. 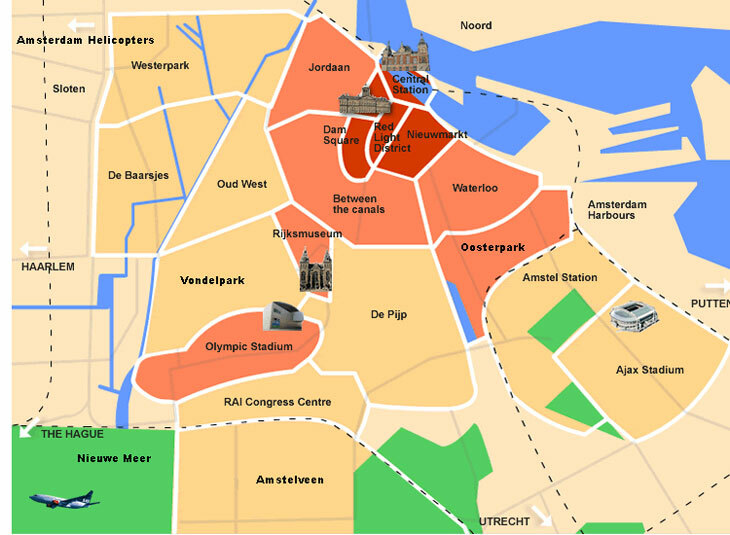 Noord district is located north of the city centre and is easily accessible by local means of transportation. It is mainly a residential area with blocks of flats, modern apartments as well as large departments stores and other urban facilities. One of the main hospitals BovenIJ is also situated there. Flora and Volewijks parks are great places for jogging and walking. The harbour area is situated in the city centre of Amsterdam in the vicinity of Central Railway Station. The two main attractions of the district are: Stedelijk Museum and Shipping House. The museum is devoted to the modern art that was created after the end of the Second World War. However you may also find there some travelling exhibits from many other countries. The Shipping House is one of the most famous and worth seeing monuments in the capital of Holland. It was designed by architect van der Mey and built for six Dutch shipping companies. The building is richly decorated with elements that remind of the times when Holland was a colonial and sea power. At present it is a seat of Municipal Transportation Company. Nevertheless you may take a part in a guided tour of this unique monument. Zuidoost is a residential district situated on the south-east suburbs of Amsterdam. The city centre is easy to reach by car or means of public transportation. Zwanenburg is strategically located between Amsterdam and Haarlem. Schiphol International Airport is just few kilometres south from the town while both Amsterdam and Haarlem may be easily reached by car or bus. Hoofddorp is a small town situated about 30 km of the city centre of Amsterdam. Due to its location close to the Schiphol International Airport the town attracts many transit travellers. However the centre of Amsterdam with its splendid attractions may be easily reached by car or bus. Osdorp is a peaceful residential neighbourhood situated on the suburbs of Amsterdam. It is just a few kilometres from Schiphol International Airport and about 20 km of the city centre. Small lake and picturesque park provide great recreation area thus you will surely feel comfortable and safe in this district. Amsterdam Schiphol is more than an airport, but the Netherlands newest city. It caters to an audience wider than the humble traveller. Among its offbeat attractions are a casino, a sauna and massage service Among Schiphol's advantages is that it is all housed under one roof, with none of the terminal hopping that causes minor panic in transfer passengers or sometimes confuses unwary first time users. Everything emanates from the massive Schiphol Plaza, the airport's central hall, which gives access to car parks, the conveniently located rail station and puts pressure on your wallet by providing more than 40 shops. Schiphol scores highly for its catering both before and after passport and security, and has thoughtful touches like a nursery for people travelling with young children. Amsterdam, often called Venice of the North lies on approx. 90 islands, separated by some 100 kilometres of canals, linked by about 400 stone bridges. Amsterdam has been designed in a crescent shape, which is possible to observe only from a bird's eye (helicopter) view. The city's shape was established in the XVIIth century: Canals forming rings emerged and continue to be a permanent feature of the city. Streets and canals assemble the crescent and therefore entire Amsterdam. Holland's canals serve a number of very important purposes. First they were used to drain the land so homes and farms could be established where once there was water. Second they provide a means of transport for goods from inland regions to the sea. Third they are homes for thousands who live on houseboats. Houseboats have become very trendy and can be seen on most canals in Amsterdam. Many of Amsterdam's canals were filled in around the start of the 20th century, mainly for sanitary reasons. A canal cruise is definitely a recommended way to discover the city of Amsterdam. The Heineken Brewery represents one of the achievements of the Dutch beer industry. Heineken beer is said to be the nation's pride and joy. The museum is located in a genuine brewery site. The original brewery, which this site hosted, dates back to 1867. It remained a working complex up until 1988. Today the brewery has become a museum where you can experience the history of the Dutch national beer, together with the tradition and craft of brewing. Visitors can explore the giant malt silos and brew house and discover the secrets of the pilsner beer, of which the Dutch are so proud. The Van Gogh Museum offers a unique possibility to experience the art and times of Vincent Van Gogh. The museum houses a more complete and impressive collection of the artists works than any other in the world. Along with observing the evolvement of Van Gogh's art through subsequent stages of his life, paintings of his contemporaries can also be admired in the institution. The collection section is organized into three parts, featuring the work of Vincent van Gogh, the work of other artists and the history of the museum collection. Van Gogh's work is organized chronologically into five periods, each representing a different phase of his life and work: The Netherlands, Paris, Arles, Saint-Rémy and Auvers-sur-Oise. Amsterdam's Rijksmuseum is the largest museum of art and history in the Netherlands, housing over one million objects. It is best known for the collection of 17th century Dutch masters, with twenty Rembrandts, works by Vermeer, Frans Hals and Jan Steen. The museum also houses art deriving from the Middle Ages and the 18th & 19th century. Another area of interest are collections of sculpture and applied art: furniture, glass, silver, delftware, dolls' houses, tapestries, fashion and other decorative bjects made in the Netherlands and Europe between the medieval period and the early 20th century. The Print Room exhibits selections from the museum's vast, internationally famous collection of prints, drawings and photos. Additionally the museum presents a collection of Asian Art. The Asian Rooms offer work of art from countries such as Indonesia, China, Japan and India. The Rembrandt House Museum is located in the genuine residence of the famous Dutch painter. The intention of the museum was to reconstruct Rembrandt's life and his every day surroundings. Therefore the entire house is meant to give the impression that the artist has just left it. Amongst the rooms outlined with the artist's graphical work, are paintings of his friends and teacher. A room of special interest is the so called curiosity cabinet, filled with treasures Rembrandt brought from foreign journeys. Items from around the world can be found there, including stuffed animals, unusual weapons, plaster busts and colourful shells. The Begijnhof is a courtyard, deriving from the early 14th century, a time of great prosperity in Amsterdam. The Begijnhof was a sanctuary for the Begijntjes, a Catholic sisterhood who lived like nuns, although they took no vows. Houses in Begijnhof are still occupied by single women. The beautiful houses are adjoined by neatly trimmed gardens. One of the buildings of the courtyard is Amsterdam's oldest surviving house Het Houten Huis supposedly built in 1420. Walls of the houses are lined with tiny masterpieces, tiles with biblical themes. The southern part of the square features a medieval English Church, standing tall with its original tower dated back to the 15th century. Relics of the Catholic past can be found in another sanctuary, the Begijnhof Chapel, a clandestine church, completed in 1680. Amsterdam's Hortus (botanical garden) has from way back been known as the town's pride and joy - an oasis of peace and beauty at the very centre of the bustling city. The garden is almost 400 years old. Established in 1638, an herb garden established by Amsterdam's doctors and pharmacists, the Hortus has evolved over the centuries into a live museum with a unique range of plants from all continents. Behind the garden's monumental entrance, at the boundary of the city centre are six thousand different kinds of plants.